A couple of years ago, a close friend of mine gifted me a Flirting for Dummies book. Everyone who has seen the copy in my house, and invariably asked me why I have the book, and I reply, “Oh, it was gifted to me as a joke.” And, it was, but not really. I mean, I am a terrible flirt. I have never known how to read the signs or how to put myself out there, or absolutely anything necessary to draw attention. I used to think, one day, I will read the book, flirt my way through life and then we will see who’s the real dummy. I never read the book. I skimmed through the book and realised I hated self-help books. It was only telling me things I already knew, but also putting them across as a foolproof method. The thing is it all sounds great in theory, but in practice, all the knowledge in the world can’t help you. So, I vowed to stay away from self-help books, especially on matters relating to love and dating. I managed to keep the vow until I was asked to review Aryka Randall’s She’s Just Not That Into You. 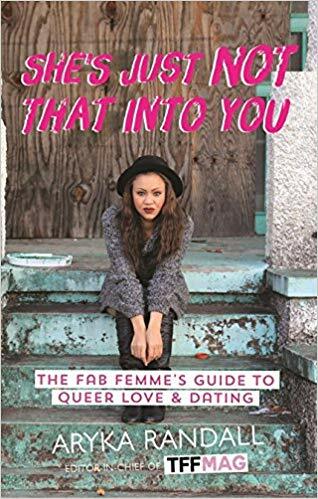 “The Fab Femme’s Guide To Queer Love & Dating” reads the tagline of the book, and it is exactly what you get. Divided up into 11 chapters, including an introduction, the book is an easy read for several reasons. It is written in an accessible and relatable language, the occasional artwork and pink accent that pops in every now and then makes the book more approachable, and most importantly, she is only telling us things we already know. But, that has always been the reason why self-help books are so eye-opening, I assume. They don’t just tell what you already know, they remind you why you need to really practice what you know. Randall has a clear target audience in mind. She is talking to women in their thirties who have been screwed over by their relationships one too many times. But, the book has a lot of insight to provide even if you don’t fit the demographic. When I started reading the book, I had not been in a relationship, ever. By the time I finished the book, I had just entered a relationship with someone I met online. And hey, just for the record, I didn’t need the help of any Flirting for Dummies. Now, who’s the dummy? Anyhow, the book is actually a fairly short read. I just kept having to keep it aside on account of my ever-piling college work, my tendency to procrastinate and my slight aversion to having people telling me what to do. Even then, I found that the book had quite a lot of interesting points to offer. She tells us that you need to know who you are and love yourself before you can love someone else and expect to be loved. She also, tells us that most often, we attract the wrong people into your life because that’s the energy you put out there and that if you think you will find happiness when you are in a relationship, you will never really find happiness. All of these, we all already know, on some level. So why read the book? Randall doesn’t stay on the surface of the situation. She digs deep and tells you exactly why relationships fails, and what needs to change so that one can find a better chance at love. Some of the ideas she presents are simple, like finding the yin to your yang or finding someone that makes you find your right balance and make you want to be better. She also takes us through moments of introspection and asks us to really look into our dating patterns to understand who you are— a filler, a u-haulee, runner or chaser. All of these sounds like random inane terms, but it works in terms of helping yourself understand who you are a person, and what exactly you are looking for. Is this book a must-read? I don’t know. If you are someone who is wondering why relationships have continued to fail you time and again, no matter what, then this is probably a good read for you. Otherwise, feel free to skip right through.